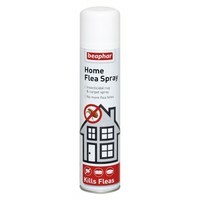 Beaphar Home Flea Spray is an economical and effective flea treatment that can be used safely within the home. Ideal for getting into hard-to-reach spaces such as behind radiators, skirting boards and cracks in the floor, Beaphar Home Flea Spray contains a fast-acting insecticide to kill adult fleas and an Insect Growth Regulator (IGR) to prevent the development of larvae and eggs. Beaphar Home Flea Spray is also effective on soft furnishing and pet bedding.